What will happen at the hearing assessment*? When is the best time to treat my hearing loss? What are some of the early signs of hearing loss? When should I have my hearing tested? What is the relationship between hearing loss & dementia? How do I care for my NeuroTechnology™? What payment options do you offer to assist me paying for NeuroTechnology™? Step 1: The Interview. First things first....we will ask you "What brings you in to see us today?" (or some variation of that "why" question). This helps to set the stage for understanding your specific hearing related issues, concerns and experiences. This conversation is the baseline to helping us understand why you "raised your hand and are seeking help". We want to understand your experience with your hearing and if there is a loss, how it impacts your life. Is it impacting your relationships? Is it getting in the way of your performance at work? Having a companion present during this part of the evaluation is VERY important in us gaining a clear understanding of how well you are hearing and understanding. Some of our patients wait their entire life to go fishing with their grandchild and now their hearing loss is robbing them of the richness of that experience and getting in the way of developing a deeper relationship. Treating hearing loss is a process steeped in science, engineering, technology and clinical medicine. There is also an "art" to treating hearing loss, and this skill is developed with years of experience. In order to develop the right treatment plan for each patient, first there must be the proper diagnostic procedures that test every aspect of your hearing. Step 2: Examination of Your Ear Canals. We need to make sure your ears are healthy enough for testing. We will observe your ear canals to make sure there is no wax build up, infection or disease blocking your canals which could interfere with your hearing. Tympanometry will be performed which can rule out any medical condition causing hearing loss involving the eardrum and/or the space behind it, including the middle ear bones (the "Hammer, Anvil, and Stirrup"). From there, it is important to establish the degree or stage of hearing loss. This is where you will hear "beeps" and respond by raising your hand or clicking a button whenever you hear the beep. While this test has been around for a long time it still gives us a lot of information. It will tell us how well you hear and if there is a hearing loss, what type of hearing loss. But even with the information gathered from this test, it is only one piece of the puzzle. Next, we need to find out how you hear words and conversation. This is the most important testing we will perform and is designed to assess your cognitive hearing, e.g. how well you understand words in quiet and with background noise. (After all, nobody comes to our office complaining that they can't hear beeps!) This line of testing will truly help us understand how well you hear, and how well you process words and conversation. In some of the word testing, we will use your companion's voice. Once all the testing complete, we will review our findings with you and your companion and then recommend a treatment plan. These results are personal and can help you better understand any difficulty you are dealing with on a daily basis. Understanding the results can also be just as important for family and loved ones. Although an individual with normal hearing can only imagine what it feels like to suffer from permanent hearing loss, gaining an understanding of the degree of hearing loss can help them gain perspective on what you are going through and how much of a strain it can be. These test results will determine the medical treatment plan and help initiate the journey towards improved hearing clarity and cognitive health. As Soon As Possible. Hearing loss is associated with increased rates of diabetes, heart disease, kidney disease, thyroid disease, falling, and the development of dementia. The longer you wait, the more you are depriving the brain of proper auditory stimulation, often referred to as auditory deprivation or even phonemic regression. Your brain is not getting the proper auditory stimulation and auditory cues that it needs to run at 100%. The brain is a very simple "Use It or Lose It" mechanism, and auditory input can help to provide the proper, constant stimulation our brains are accustomed to and designed to receive. Hearing is not a sense to take for granted. Yet the statistics are alarming - it is estimated that only 20% of individuals with hearing loss actually seek medical treatment. Without the proper treatment of hearing loss, the brain is being asked to work on overload, constantly. We often use the analogy "living with untreated hearing loss is like asking your brain to drive sixty miles per hour in second gear." Neuroscience calls this "Cognitive Overload" - asking the brain to process auditory, visual, and other cues just to put together a simple sentence. Hi Martha! How is your puppy doing? Is he eating and growing OK? I hope we can get our dogs together soon to play. I, Mara! Ow I our uy oing? I e eaing and groing o? I oe e an ge our do ogeer oon o ay. I think you will agree that this is rather alarming. This is what it could sound like to the patient with auditory-only cues. Of course, the brain will use visual cues, lip-reading, etc. to fill in the missing pieces - but the brain was not designed to take on that much stress and effort just to understand a simple sentence. This cognitive overload is hypothesized to be of the leading reasons that individuals with hearing loss can be FIVE TIMES more likely to develop dementia. Hearing loss is typically a slow, gradual onset disorder that silently (pardon the pun) affects the individual. The most common symptoms experienced by most (perhaps not all) patients are difficulty hearing in background noise, tinnitus and thinking other people mumble or speak too softly. Most people who experience the initial symptoms of hearing loss do not even realize it is happening. It is far easier to blame the acoustic of the room, the volume of the background noise, or the person speaking (i.e. "they mumble") than it is to accept that it's your hearing that is lacking. it is also difficult for many patients to rationalize the need for medical treatment of hearing loss because in some (ideal listening) situations (i.e. sitting at a table on-on-one in a perfectly quiet environment) may not be much of a challenge. But the truth is...a mild hearing loss is a major problem. The American Speech Language Hearing Association, the American Academy of Audiology, and the American Medical Association have all considered the recommendation of including 'hearing evaluation / screening' between the age of 50-60. In our book "Stop the Isolation", we use the catch phrase 'Ears and Rears' as ourway of getting people to remember to have their hearing checked when they turn 50 (and of course, have a colonoscopy too!). Regardless of age, if you are noticing any of the symptoms of hearing loss, e.g. difficulty hearing in noisy situations, difficulty hearing the TV (compared to others), if your family is suggesting you get a hearing test, or if you have ringing in your ears (defined as Tinnitus), you need to have a baseline test to diagnose and receive treatment recommendations. Unfortunately waiting too long can significantly impact the expectations and outcome of treatment, and sadly every audiologist I know has a patient they have had to tell they waited too long and that the benefits of treatment will be minimal. Untreated hearing loss has been proven to increase your risk for dementia by 200% (mild loss)-500% (severe loss) (Dr. Frank Lin, Johns Hopkins). Both dementia and hearing loss are progressive, degenerative diseases. Hearing loss causes the brain to not get the exercise it needs to stay healthy and the brain will atrophy at an increased rate. Someone is diagnosed with Alzheimer's every 3-4 seconds and estimates are for it to triple in the next 30 years. It is a very debilitating, costly disease. Wearing hearing devices to stimulate the brain is a small price to pay to delay the onset of dementia. 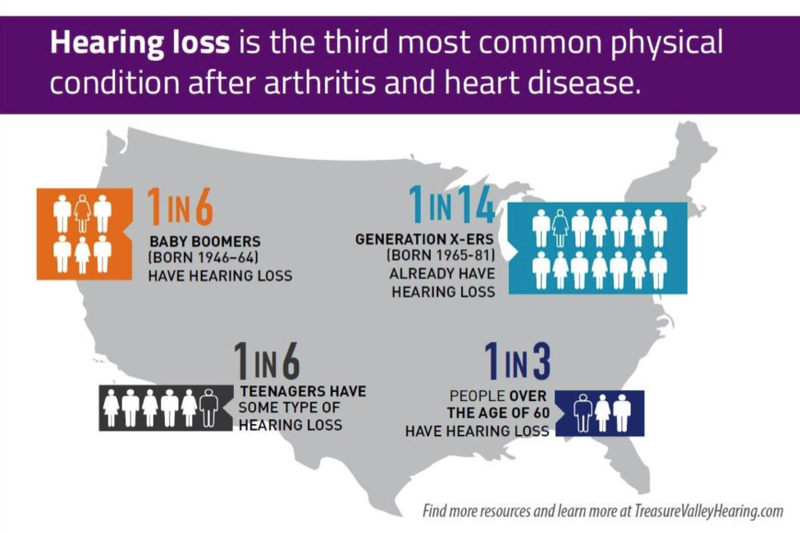 As you can see from the graphic below, hearing loss affects seniors at a greater rate than young people. This is not to say that hearing loss is an age-related disease, rather sensori-neural hearing loss is generally due to a lifetime of exposure to noises that have worn down the hair cells in your ear used to conduct sound to the brain. Altogether, 48 million people are affected by hearing loss in the United States. There are three risk factor associated with hearing loss and dementia. Social Isolation - People with hearing loss tend to isolate themselves because it becomes increasingly difficult to communicate. They may feel embarrassed, be afraid of making social mistakes or feel lonely, even in the presence of people. Increasingly, social activities are exchanged for quiet time at home. But the brain needs constant social stimulation, hence the reason this becomes a risk factor. Cerebral Atrophy - Our brains shrink as we age, but studies have shown that people with hearing loss experience accelerated brain atrophy which results in less brain volume for housing memory, hearing, speech and language. Cognitive Overload - Hearing loss causes you to have to concentrate extra hard to understand speech and recall speech. It can be exhausting! But studies have now shown that this extra strain causes you to access a part of the brain reserved for other tasks, causing brain overload. It is like driving a car on the freeway at 60 miles per hour in first gear. Eventually the car is going to break down. ...And eventually your brain breaks down, causing dementia. The good news is that people who properly treat their hearing loss have a demonstrated 20% increase in memory recall, 20% reduction in listening effort in noisy environments, and 30% improvement in understanding speech in noisy environments. NeuroTechnology™performs best at this task. Traditional hearing aids increase the volume for the wearer and not too distant technology had microphones frontally focused toward where someone would generally be speaking to you while limiting background noise. While these technologies were advanced for their time, we now have NeuroTechnology™ that is a much more advanced way of processing the sounds. It scans your environment 100 times per second and 360 degrees around you and has filters that know the difference between background noise and voices enabling you to hear in a much more natural way. You can hear the truck approaching behind you while concentrating on a speaker that may be standing next to you. Hear background noise in a restaurant while still having an enriching conversation with friends at the table. That background noise could be entertainment that you definitely wouldn't want to miss. Because this technology exercises your brain in a much more natural manner, it is reaching the brain neurons to a much larger degree by increasing the auditory input to the brain. Speech is much clearer and more natural. Disturbing noise is brought to a level that is comfortable presenting you with clear speech for the brain to process. High frequencies are lowered to mid-frequency ensuring inaudible sounds become audible again. The adaptive technology delivers speech details that you need, not eliminating them. There are different types of NeuroTechnology™ - each designed and custom-programmed by our team to ensure you hear the sounds you need to hear, keeping your favorite activities in mind. We hear with our BRAINS, not our ears. This technology ensures the brain is getting the ultimate in exercise, keeping your brain functioning the way it was meant to function. Whether your loss is mild, severe, or anywhere in between,NeuroTechnology™can deliver enhanced clarity surround-sound in the most natural way. We have found patients that occasionally test as "normal" on a traditional audiogram, but still have difficulty understanding speech, and when fitted with this technology perform much better in their daily lives. That is because the "normal line" of an audiogram may not be normal for them and a little help from hearing technology can make all the difference in their ability to enjoy the world around them. NeuroTechnology™ comes in different performance levels to suit the loss of the patient as well as a paradigm of colors and features including BlueTooth connectivity (for attaching to your smartphone, music devices, TV and Smart Home devices), wind noise management, soft speech booster and tinnitus support. The styles can be match to your hair color if you desire making them virtually invisible. Daily Care: To ensure oils from your skin and wax from your ears (cerumen) do not build up on your devices, wipe them down daily with the provided lint-free cloth. The provided pick/brush can help you remove embedded cerumen in the domes. Weekly Maintenance: Batteries in your NeuroTechnology™ can last 4-7 days, depending on your use, connectivity to devices (i.e. Bluetooth connectivity to your phone, tablet, home TV,) etc. Your devices will deliver an audible battery warning tone when the batteries need to be changed. Be sure to change batteries in both units at the same time. For those patients with rechargeable batteries, be sure to properly place the units in the charging station every evening to obtain a full charge. Monthly Care: The domes and wax filters on your device need to be changed out monthly (for some patients, more often). The domes play a crucial role in the acoustic delivery of the devices, so must be kept clean. If cerumen builds in the baskets, it can intermittently or permanently prevent sound stimulation from the units. NOTE: In the rare case your NeuroTechnology™ should malfunction, please follow these two steps before contacting our office, as it is the cause of most hearing aid emergency calls. These two steps could help you avoid frustration and a trip to our office. Should these steps not correct the malfunction, do not hesitate to give us a call for support. The first thing we will do, just as when you go to any reputable medical clinic, is run a verification of benefits, should you have health insurance. From there, we will determine the net cost of the devices for you. Should you require financial assistance beyond any insurance, we will provide you with an application for CareCredit which will enable you to keep monthly payments to an amount you can afford. When you are weighing out the financial costs versus the medical benefits, remember that this is an investment in your health that may be the difference between remaining healthy or developing other health issues. Since 1987, CareCredit has been helping individuals cover the costs of healthcare. Originally a credit card covering dental care, today more than 200,000 healthcare providers and health-related retailers partner with CareCredit to help consumers finance health-related costs. We are pleased to be part of CareCredit's network. CareCredit can be used to cover any costs at Treasure Valley Hearing & Balance. You can apply for CareCredit below, or schedule an appointment at a convenient Treasure Valley Hearing & Balance clinic where we will be happy to assist you. CareCredit has several options available including up to 18 months with zero interest. The Idaho Assistive Technology Financing Program is a consumer-directed program funded by both private and public money that is designed to help Idahoans obtain and use the assistive technology they need to be successful in employment, education, recreation, and in the community. The Program has been in existence since 1994, thanks to the collaboration between the Idaho Assistive Technology Financing Program, Idaho banks, and the Idaho Community Foundation. They have come together to provide low-interest loans to Idaho citizens with disabilities to purchase assistive technology. Anyone who has a disability, or who is the parent or legal guardian of a person with a disability, and who is a resident of Idaho may apply for a loan. The loan funds must be used for the acquisition of assistive technology for the person with a disability. An applicant eligible for a loan must demonstrate an ability to repay the loan, must be creditworthy, and must meet the Program criteria. To contact your provider directly, email him/her directly at their email below. They work Monday through Thursday. Expect them to reply within 2 working days of sending them an email.